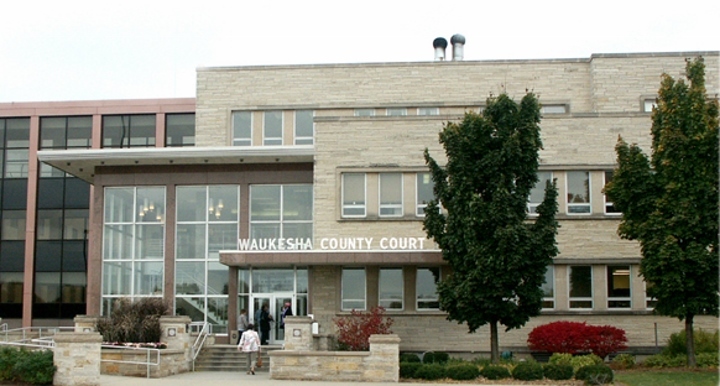 Courthouse of Waukesha County, Wisconsin. Photo is in the Public Domain. For years, Waukesha County has been known as the place that the hopes of Democratic candidates go to die. If the county were detached from Wisconsin to join Texas, for instance, Wisconsin would become safely blue. This was underlined some years ago when the Waukesha county clerk messed up in submitting her county’s vote count; for a brief time, the liberal candidate for Supreme Court was wrongly believed the winner. As part of a USA Today series before the 2016 election, the Journal Sentinel’s Craig Gilbert estimated that “Waukesha produced more GOP votes per capita than any county its size in America.” To a large extent, Democrats have given up any hope of electoral success in Waukesha County and don’t field candidates for most offices. 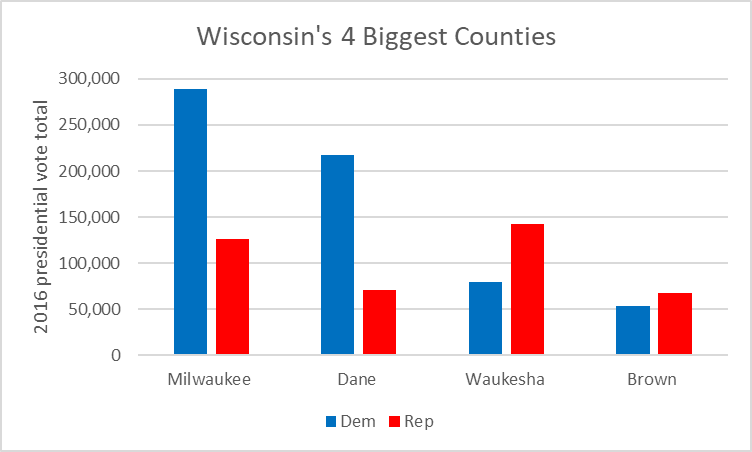 Yet, as the graph below shows, Waukesha County is a rich source of Democratic votes — actually third largest in total number of votes. Without those Waukesha County votes, statewide Democratic candidates would have little chance of success. If the Democratic Party were a business, Waukesha County would be a rich source of customers. A company that enjoys slightly more than one-third market share is likely to do very well. Unfortunately for Waukesha Democrats, the much larger Republican turnout in the county means a local Democratic candidate faces bleak election prospects. In many cases, they don’t even try and the GOP candidate is elected unopposed by a Democrat. This month’s election results in Virginia and other states were great for Democratic morale. As many observers pointed out, the size of the Democratic victory in Virginia was due mainly to increased Democratic turnout in the areas already trending Democratic, particularly the growing suburbs around Washington DC. However, the Virginia election results also contained warnings for Democrats. In the countryside, especially the mountainous western and southwestern areas outside a few cities, Democrats lost badly. Unless Wisconsin Democrats figure out how to appeal to win back people in those areas, especially the Obama-Trump voters, they will likely continue losing in Wisconsin. Also, Republican gerrymandering appears, pending the outcome of recounts, to allow Republicans to maintain control of Virginia’s legislature, despite losing the vote by 9 percent. In Wisconsin, the Democrats’ hurdle is even higher. Even with a 9 percent vote margin, I project that Democrats would win control of only 48 out of 99 Assembly seats. Demographically, Waukesha County might seem to resemble the profile of the Virginia areas that are increasingly Democratic—generally prosperous and with a higher percentage of residents with college degrees than the rest of the state. Does this mean that the county is poised to become bluer? Not so far. In 2012 Barack Obama won just 32.6 percent of the county, and in 2016 Hillary Clinton barely upped that, to 33.3 percent, perhaps mostly due to a fall off in the Republican vote, the no-Trump voters. 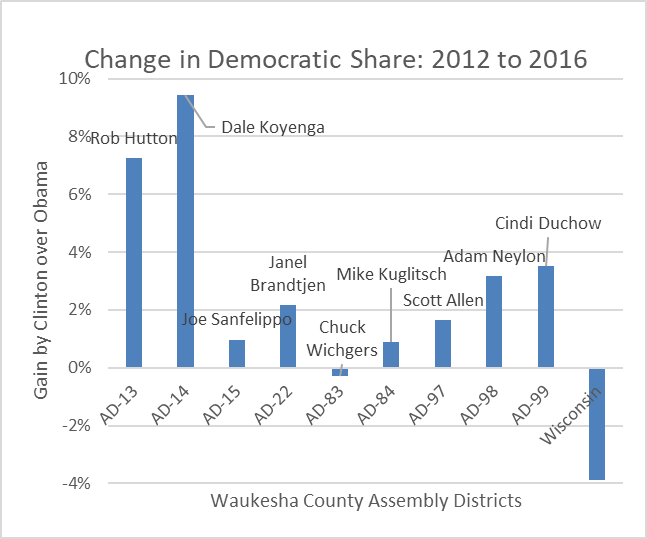 However, look at the assembly districts listed in the next graph that are either wholly or partially in Waukesha County. The bars compare the share of the district’s vote that Clinton received in the 2016 election with Obama’s in 2012. As the graph shows, in all but one district (the 83rd), Clinton outperformed Obama four years earlier. The results for these districts stand in sharp contrast to the Wisconsin state-wide results, in which Trump outperformed Mitt Romney, allowing him to barely carry the state. The chart shows the current representatives—all Republicans. Only one—the 14th—had a Democrat opponent in the 2016 election. These districts are shown on the map, taken from the official map of state districts. Note that the biggest growth in the Democratic vote share came in two districts that straddle the Waukesha-Milwaukee county line, the 13th and 14th. The next graph compares the Democratic share of the two-candidate vote in the 2012 election with that in 2016. 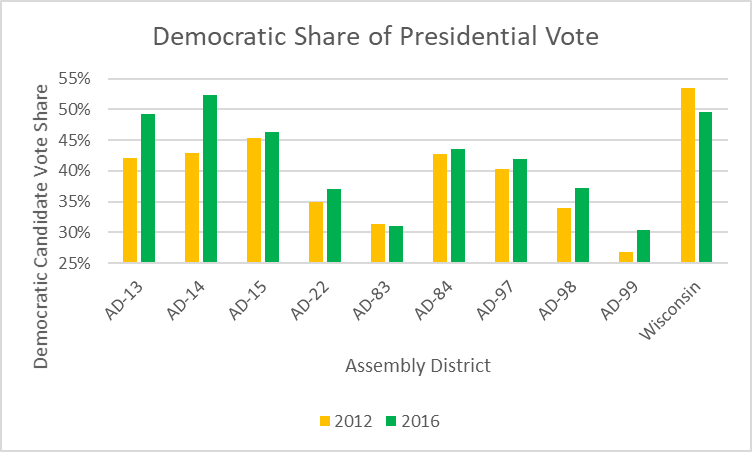 Using the presidential vote as a proxy for the likely vote, if both parties fielded candidates for Assembly, most districts, while slightly more Democratic, are still overwhelmingly Republican. There are two exceptions. Based on their presidential vote in 2016 the 13th and 14th appear competitive if 2016 voting patterns persist in 2018. The two that appeared closest to competitive in 2012—the 15th and 84th, did not move enough to be within striking distance. It is notable that Assembly Districts 13, 14, and 15 together form the 5th Senate District, currently represented by Leah Vukmir. The shift in this district’s vote is substantial. In 2016, Clinton won 49.5 percent of the two-candidate vote in that district, compared to 43.3 percent for Obama four years earlier. Observing that her district was trending blue may have influenced Vukmir to run for US Senate, rather than reelection to state senate, in 2018. 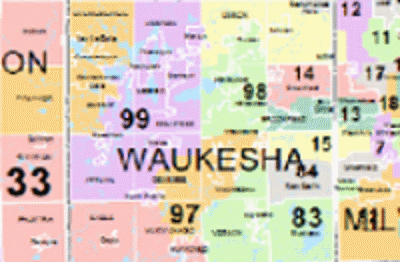 Waukesha is not unique in the number of candidates with no opponent. In fact, almost half the representatives—49 out of 99—enjoyed that fortunate position. And contrary to the impression that the races in Waukesha County may give, more Democrats than Republicans were unopposed statewide. Overall 28 of the 35 Democrats in the Assembly ran unopposed, compared to 21 of the 64 Republicans. While this discrepancy may seem favorable Democrats, it is a byproduct of Republican gerrymandering in which the strategy is to pack as many Democratic voters into as few districts as possible. Democrats thereby win overwhelmingly in a minority of districts. The lack of competitive districts makes both parties more insular and more ideologically extreme. When it comes to statewide elections both suffer from a shortage of candidates with experience appealing to members of the other party. Both Democrats in Waukesha and Republicans in places like Milwaukee face the challenge of building a vibrant party when the possibility of winning local elections is remote. The statistics on these legislative districts suggest there may be more potential for Democratic candidates than might be thought. But there is no guarantee of Democratic success, particularly if the party can’t field candidates in such districts. And statewide, the party will probably never succeed if it doesn’t find ways of answering the sense of crisis in the smaller cities and rural areas of Wisconsin. My small area on the east edge of Waukesha County used to be regularly DSemocratic but maybe not now.